The media keeps misfiring when it writes about guns. If the media wants a healthy conversation about firearm laws, it needs to stop getting basic gun facts wrong when reporting on mass shootings. 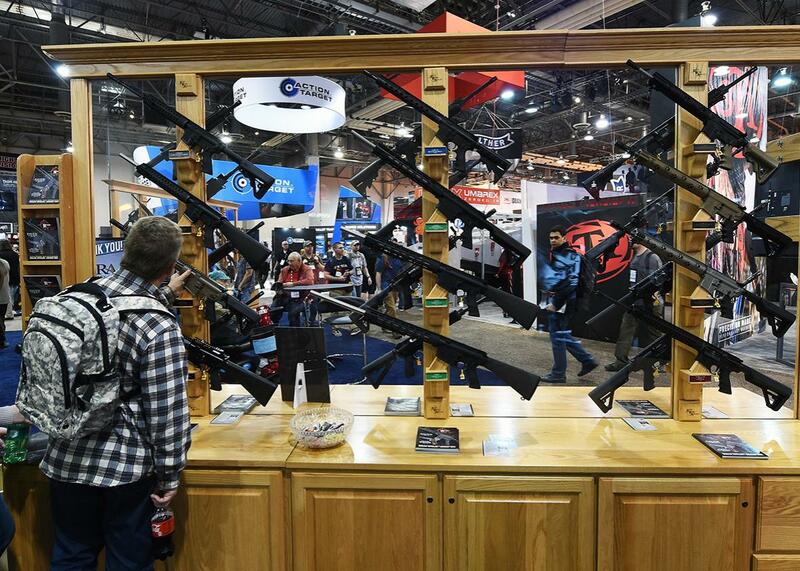 A convention attendee looks at rifles displayed at the Rock River Arms booth at the 2016 National Shooting Sports Foundation’s trade show on Jan. 19 in Las Vegas. It’s like clockwork. Sick, twisted clockwork. A mass shooting happens. There is a flurry of confusing reports. A death toll is announced, a shooter identified. And then, even before the crime scene is cleaned up, come the pleas for gun control. The urge is understandable. In the wake of the Orlando, Florida, shootings (as with San Bernardino, California, before that, and Umpqua Community College before that, and Charleston, South Carolina, before that), it’s impossible to read about the victims, about the joint funeral planned for Juan Ramon Guerrero and his partner Drew Leinonen, and not feel a horrible combination of sadness and outrage and a wish to do something. But you already know how this will play out. Gun-control advocates and their allies in the media will attack the gun-rights crowd as cold-hearted, stubborn, and out of touch. They will complain that no new legislation will result from the tragedy, and they will be right. There are many reasons that this cycle repeats as it does. We live in a divided society where people cocoon with like-minded allies, and we’ve stopped listening to the other side. The NRA is powerful. We get distracted and move on to the next shiny thing. But one important point: The mainstream media lobbies hard for gun control, but it is very, very bad at gun journalism. It might be impossible ever to bridge the divide between the gun-control and gun-rights movements. But it’s impossible to start a dialogue when you don’t know what the hell you are talking about. Media stories in the wake of mass shootings typically feature a laundry list of mistakes that reflect their writers’ inexperience with guns and gun culture. Some of them are small but telling: conflating automatic and semi-automatic weapons, assault rifle and assault weapon, caliber and gauge—all demonstrating a general lack of familiarity with firearms. Some of them are bigger. Like calling for “common-sense gun control” and “universal background checks” after instances in which a shooter purchased a gun legally and passed background checks. Or focusing on mass shootings involving assault weapons—and thereby ignoring statistics that show that far more people die from handguns. Considering that a quick online search should provide all the information journalists need to get this right, it’s amazing that journalists don’t know the difference between an assault rifle and an assault weapon. An assault rifle is a fully automatic weapon that can fire multiple rounds with a single pull of the trigger, up to 950 rounds per minute. An assault weapon is a semi-automatic gun that can accept detachable magazines and has a pistol grip and an adjustable stock (to increase the gun’s length). * The term assault weapon itself, of disputed origin, is a thorn in the side of gun enthusiasts, who point out that the differences between “assault weapons” and other semi-automatics are largely cosmetic and don’t increase the gun’s lethality. It’s a little surprising that Mother Jones conflated the two in its Orlando coverage. The magazine tends to be scrupulously sober-minded about guns; its database of mass shootings is thorough and resists the urge to inflate fearmongering statistics. Less surprising, perhaps, are Rolling Stone’s errors. The magazine’s claim that it’s easier to get an assault rifle than an abortion is particularly egregious, since assault rifles are regulated by the National Firearms Act of 1934 and require a lengthy permit process that is handled by the Bureau of Alcohol, Tobacco, Firearms, and Explosives. Do you want an M16, the military version of the AR-15? Expect a wait of seven to eleven months. Perhaps out of increased frustration at the inability to pass new anti-gun legislation, some have called, sometimes sarcastically, for the Second Amendment to guarantee your right to bear a musket, which was a common weapon at the time of the amendment’s ratification in the late 1700s. Muskets could fire single shots or a “cluster” shot with multiple projectiles, but they had to be reloaded after every firing. In the Washington Post this week, Eugene Robinson wrote, “When the framers wrote of ‘arms,’ they were thinking about muskets and single-shot pistols. They could not have foreseen modern rifles or high-capacity magazines.” A few problems with this. First, gun enthusiasts will be only too happy to educate you on the existence of the Girandoni air rifle, which dates back to 1779, 12 years before the Second Amendment was ratified. It used compressed air, not gunpowder, and could hold 20 bullets at once. Lewis and Clark had one with them when Thomas Jefferson sent them out to explore the West. Second, we can argue all day about what the Framers—all now dead for 200 years or so—intended with the Second Amendment. But it seems disingenuous to argue that, in crafting a document that has largely served us well for more than 220 years, they couldn’t imagine improvements in gun technology. That gun writers crow when the media makes mistakes like this indicates how little regard there is for the media from the pro-gun community. There are several ways the media can remedy this situation. For starters, treat guns like any other beat (as the Guardian has done with Lois Beckett). Media outlets tend not to send sports writers to cover the Supreme Court or style writers to cover a murder. Ignorance undermines authority. If you want to report on guns, you need to understand the differences between various weapons and how they are used. Spend time at a shooting range and learn how to fire a gun. Be able to interview an NRA member without scorn or derision. News outlets make a lot of noise about diversity. They should apply a more holistic definition. Yes, the industry should strive for inclusiveness in gender and race and ethnicity. But it also needs more geographical, socioeconomic, and ideological diversity. Employ writers who, if not gun enthusiasts themselves, grew up in a place where hunting was a normal part of life. Provide a broader range of gun coverage. As long as the media sensationalizes mass shootings, statistics will not be on their side, and gun-rights supporters know this. Such events are so horrific that it makes it easy to appeal to people’s emotions. But statistically, they are very rare. Exploiting these tragedies, calling semi-automatic rifles “weapons of war” and the “weapon of choice” for mass shooters is a conversation-ender with pro-gun types. It’s much harder to write about the gun violence in inner cities, like Chicago. You’re dealing with systemic problems far beyond guns. But ignoring the wider violence creates the impression that the media cares only about rifles and mass shootings. If the media wants to work toward actual solutions for gun violence, to do right by the people who are senselessly murdered, they need more than righteous indignation. They need to be better informed and more willing to engage honestly with their opponents.